Trump Wins, Trump Wins — Uh-Oh, What Now? 09 NovTrump Wins, Trump Wins — Uh-Oh, What Now? Wow. Our Brexit moment! We just witnessed a political revolution in the U.S. that hasn’t been seen since Ronald Reagan in 1980. The populist movement that began on the other side of the pond has carried over to our shores. Mohamed El-Erian tweeted last night, “Politics of anger in play. Directly related to years of low and non-inclusive growth, with associated loss of trust in the ‘establishment’.” Our nation is so polarized politically. It has been our take that no matter who won the election, as long as there was a definite result on Election Day, half of the country would wake up the next morning disappointed. This election cycle truly has been something very different from the norm. The conventional wisdom called for Hillary Clinton to take the White House, Democrats to take back the Senate, and Republicans to hold the House. That was very far from the actual outcome of Republicans taking the White House and holding onto both the Senate and the House, albeit with slimmer margins than before the election. The major polls have now incorrectly called the two most important elections in the world in 2016. Looks like the political polling industry has some soul-searching to do. Now what do we believe this means for the markets and the economy? For the short term, it is safe to say that volatility will surge and the markets will plunge. If this truly is similar to Brexit, then we feel the decline in the markets will be a short-term event with the markets rebounding quickly. It only took a few short days for the markets to recover from the initial Brexit shock. Investor sentiment suggests that may be the case again as sentiment already resides in overly pessimistic territory. 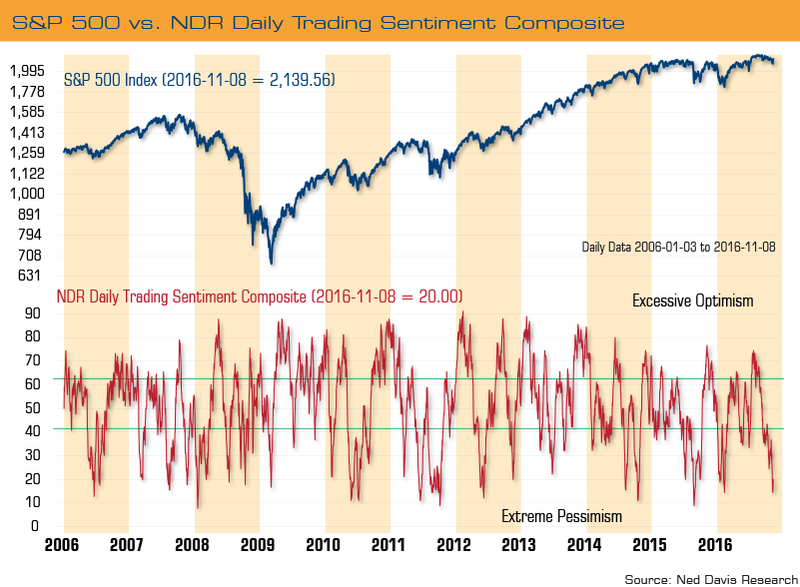 According to Ned Davis Research’s (NDR) Daily Trading Sentiment Composite, investor sentiment has really soured leading up to the election (see chart below). In particular this is due to the recent volatility, the market stalling, the FBI investigation, the surge in healthcare premiums, and divisiveness around this election. If history is an indicator, the forthcoming combination of President and Congress may not be the best outcome for the markets. For example, only 22.5% of the time since 1900 was the government run by a Republican President and a Republican-controlled Congress. During those times, the Dow Jones Industrial Average has advanced at only a 7.03% average annual pace. In comparison to a Democratic President and split Congress — which was the odds on favorite scenario — the Dow has historically advanced at a 10.37% average annual rate. From a policy standpoint what does this mean for the economy? Trump’s economic plan is considered to be pro-growth focusing primarily on tax policy, trade, and deregulation. Let’s revisit the election commentary we published a few weeks ago regarding Trump’s policies. Under a Trump administration, the Fed would likely take a more hawkish tone and could be a little destabilizing with the Fed audit crowd gaining support. Trump has been in opposition to the Trans-Pacific Partnership (TPP), but when push comes to shove, he will not want to get into a trade war with China and it is very unlikely that Chinese tariffs are meaningfully altered. It is the difference between one candidate promoting lower marginal tax rates to drive revenues through economic growth and the other candidate driving revenues through more taxation. As an example, Trump would use an easier, less punitive tax code to help stimulate economic growth. Trump has proposed fewer tax brackets and lower rates for most individuals, lower capital gains and dividend taxes, and lowering the corporate tax rate from 35% to 15%. Past performance is not indicative of future results. The opinions expressed are those of the Clark Capital Management Group Investment Team. The opinions referenced are as of the date of publication and are subject to change due to changes in the market or economic conditions and may not necessarily come to pass. There is no guarantee of the future performance of any Clark Capital investment portfolio. Material presented has been derived from sources considered to be reliable, but the accuracy and completeness cannot be guaranteed. Nothing herein should be construed as a solicitation, recommendation or an offer to buy, sell or hold any securities, other investments or to adopt any investment strategy or strategies. For educational use only. This information is not intended to serve as investment advice. This material is not intended to be relied upon as a forecast or research.